Will the next big entertainment franchise be about a bunch of slugs? Seriously, the Santa Monica-based mobile game company certainly hopes so. Today the company is launching its first animated short, Boot Camp, based on its hit game Best Fiends. The short is being distributed via the Best Fiends app, and follows the comedic shenanigans of slugs Hank and Roger as they prepare to join the Slug Army and fight the Fiends. The progression from mobile game to short film is in keeping with Seriously’s manifesto, which is to reverse-engineer Hollywood IP by starting with games and moving into short films, video, and perhaps, ultimately, a feature film. The company, which was founded in 2014 by two former Rovio executives and recently became profitable, brings a Hollywood touch to its games, with plenty of emphasis on character development and narrative, and music. This formula has helped fuel the success of Best Fiends, which has been downloaded over 70 million times and has over 2 million active daily users. Boot Camp is every bit as much of a Hollywood production as the game it is based on. 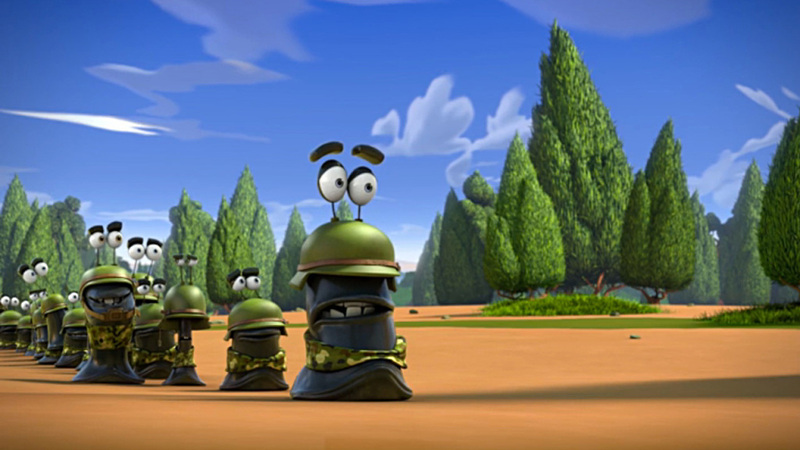 The slugs are voiced by Pamela Adlon, Mark Hamill, Kate Walsh, and other stars. And its music was similarly composed by Heitor Pereira, who wrote the music for the Despicable Me movies. Produced by Reel FX under the creative direction of Augusto Schillaci, the short even has an Emmy-award-winning writer-producer in J. Stewart Burns of The Simpsons.